Awareness-raising must also be carried out with all female newcomers. Some are mothers and have managed to leave their country to protect their children from circumcision, others have had to leave their children behind fleeing death threats or some simply haven’t yet had children. 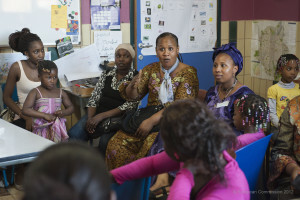 Whatever the situation of the women who we see, it’s important for us to obtain their views on female circumcision and that they participate in our monthly meetings during which various topics are approached. Subjects that are directly related to their life story : the place of religion in the mutilations, the medical consequences/complications of genital mutilations or other various topics, permitting them to understand on a social level such as the rights of foreigners, how to find a formation or meetings raising their awareness of the various realities: domestic violence, eating disorders…. 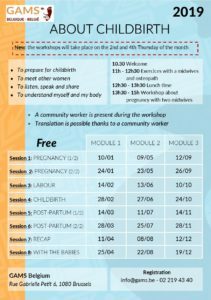 These workshops are aimed at pregnant women, circumcised or victims of sexual violence, asylum seekers, benefiting from a subsidiary protection or refugees. These preparatory sessions do not replace the prenatal consultations by a gynecologist or a midwife. They are sessions to improve the women’s well-being and to give them somewhere to ask all questions regarding care during the pregnancy and giving birth in Belgium. 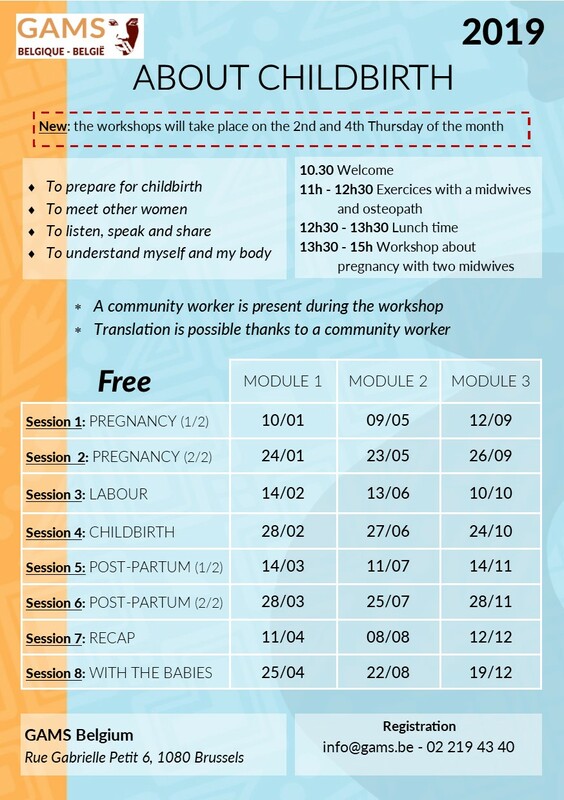 These sessions can also be a place for discussion about the pregnancy, the protection of the unborn child with regard to certain traditional practices (female circumcision, forced marriages, violence). From 2016 the meetings will be held every 15 days and not once a month : 6 sessions are devoted to pregnancy, childbirth and early post-partum and two sessions are planned with the baby after the birth. As the meeting lasts three hours and we also want to encourage good eating habits during pregnancy, a snack is offered (dairy products, fruit, bread, juice). 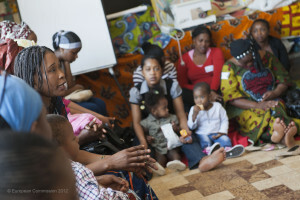 The sessions are animated by voluntary midwives trained in the problems of FGM, a GAMS community animator, but also, since 2016, by a massage therapist for one hour of physical and breathing exercises to help properly prepare for childbirth and enhance relaxation. The participation in the sessions is voluntary and free of charge. Transport costs will be reimbursed thanks to support from the AMIF project (the women are reimbursed in cash on the same day on presentation of a bus/train/metro ticket where the tariff is visible. The Youth Workshop is a group of young girls between 15 and 25 years which addresses as much non-accompanied minors as youngsters who migrated with their parents. The objective is to give the words of young girls a particular place, young adults to be, outside of the workshops on the last Friday of the month, which are aimed at an adult public. The same questions are discussed in both groups (the question of stereotypes, discrimination, equality men/women, gender violence,…) with the difference, in this workshop, to approach the contents by using creativity. Up on till now, we have created two plays « Aicha’s Destiny » (https://www.youtube.com/watch?v=KNuicmHdJS4) as well as an action flashmob danced on 6th February 2014, International Day of zero tolerance for Female Genital Mutilation, https://www.youtube.com/watch?v=KBrdC3XfY. Beyond the debates and the informative contribution of the animations, the group wants to be able to transform things in a proactive way with the participants themselves and conduct public actions. The number of participants is unlimited, the workshop is fortnightly with a totally free participation. Here is the latest workshop to date, created in 2016. 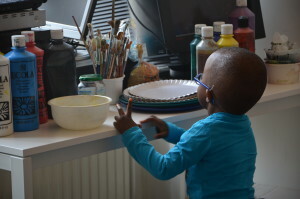 Aimed at the children – girls and boys – of families registered with GAMS and who are also directly or indirectly concerned by circumcision, other forms of gender violence but also the question of exile and connection. The workshop’s objective is to make a creative space available for both visual and bodily art in order to work on the question of physical integrity, respect for oneself and others… We think that working on the physical integrity through, among others, self-expression through movement, would allow a place for trauma but also act as a means of prevention for any other physical intrusion. The number of participants is limited to a maximum of 10 children, the workshop is presented in the form of modules of 6 workshops, for which we ask – a continuous commitment from the parents. Preliminary registration for …. One week internship planned during school holidays (spring breaks, summer holidays,…).